NeoGraft hair transplant in Naples-Fort Myers is changing the way physicians and patients view hair restoration procedures. In Southern Florida, board-certified plastic surgeon Kent V. Hasen, M.D. offers hair restoration with NeoGraft because it offers better results with improved comfort and no scarring. At Hair Restoration of Naples, you’ll enjoy personal, attentive service from a highly trained medical team in a relaxing and luxurious atmosphere. Request your consultation online or call (239) 262-5662 to schedule an appointment to discuss your personal hair restoration treatment with Dr. Hasen. You want the freedom to wear your hair very short without worrying about a noticeable scar. You want the fewest restrictions on your activity after the procedure. You have an existing scar from a past strip transplant and would like to conceal it. You’re in generally good health and have enough hair at the donor site (typically the back of your scalp). Although NeoGraft is noted for its impressive results for a wide range of patients, people who have thick, dense donor hair can expect superior results. Your consultation with Dr. Hasen will give you valuable insight into your specific options. NeoGraft Automated FUE and Implantation System is an advanced form of follicular unit extraction (FUE). NeoGraft uses an automated pneumatic (air pressure) system to extract the hair follicles (follicular units or grafts), which improves the process and the outcome. Learn more about why NeoGraft surpasses other hair transplant surgery methods. With NeoGraft, the follicles aren’t manipulated with forceps or scalpels like they are in traditional procedures. NeoGraft gently and smoothly removes the individual grafts and stores them in a protective canister during the procedure. This minimizes the risk of damage to the follicles and preserves their vitality, producing graft success rates between 95 and 97%. The older strip method of hair restoration involved cutting a 1/2-inch by 7-inch strip of scalp from the back of the head. This produced discomfort and a longer recovery, and the resulting scar was often visible. NeoGraft gently extracts very small grafts with no visible scarring, even if hair is worn very short. NeoGraft can also be used to reduce the appearance of a scar left behind by a previous strip transplant. 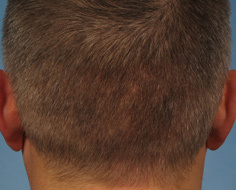 A scar reduction treatment can be performed with NeoGraft regardless of whether or not the patient desires more hair. In most cases, both the width and the appearance of the original scar can be reduced by more than 50%. 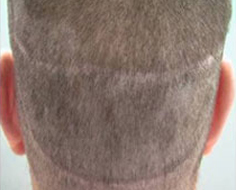 Permanent hair restoration with NeoGraft is significantly quicker than with older, manual extraction techniques, enhancing the overall experience for the patient. Because the procedure is minimally invasive, there is little discomfort or risk of complications and no sutures or scarring. Dr. Hasen can adjust NeoGraft’s suction to handle different punch sizes and skin types. This, combined with Dr. Hasen’s aesthetic and surgical skills, produces very natural-looking results that work with your unique facial characteristics. Learn more about why you should choose us for hair restoration. Dr. Hasen numbs the scalp with local anesthetic. He then applies the NeoGraft hand piece to specific areas on the back of the head. Pneumatic pressure gently draws the individual grafts out of the scalp and into the collection canister. Then, Dr. Hasen creates recipient sites in the areas of thinning hair and transplants the skin and hair grafts into the recipient sites. Because it’s minimally invasive, recovery is quick with very few activity restrictions. Following the NeoGraft procedure, patients usually experience minimal discomfort, often likening the feeling to mild sunburn. Over-the-counter pain medications are usually all that is required to relieve discomfort. Most patients can return to work the following day. After the procedure is complete, the transplanted hair follicles usually require about 3 months before they begin to grow new hairs. During this time, you may see cycles of growth and shedding. This is a normal part of hair growth and no cause for alarm. After the 3-month milestone, new hair will grow normally from the transplanted follicles. Good results will be present after 6 months and complete results visible after a year. Keep in mind that NeoGraft minimizes the symptoms of hair loss. It does not stop the process. For this reason, some patients may require occasional maintenance procedures to touch up their results. This is especially true for patients whose hair loss is the result of aging. Dr. Hasen offers several different options for maintaining your results, each tailored to your lifestyle and personal preferences. Board-certified plastic surgeon Dr. Kent Hasen performs NeoGraft hair transplant and replacement procedures at his office in Naples, Florida. His hair restoration practice, Hair Restoration of Naples, serves clients from all over Southern Florida including Estero, Fort Myers, Cape Coral, Bonita Springs, Marco Island, and Ft. Lauderdale. Copyright © 2019 Kent V. Hasen, M.D., P.A.. All rights reserved.